During our Open Day visit at The Little Black Cow Farmstay a few months ago, we got to see, amongst many other wonderful things, an old butter churner. It was a funny coincidence, as I had already planned of making our own butter at home. Every school holidays there are a few new recipes being tried out. Some stick with us forever and become family favourites, some remain a one off. Ages ago I watched Matt Preston doing one of his cheat recipes on MasterChef and printed myself that recipe from their website: No Prove Bread with Butter and Raspberry Jam. Well, jam is not exactly difficult and I make it regularly, I was more after the bread and the butter. Bread making is lovely and a journey. For years and years I used to make our own baguette and it was just to die for. 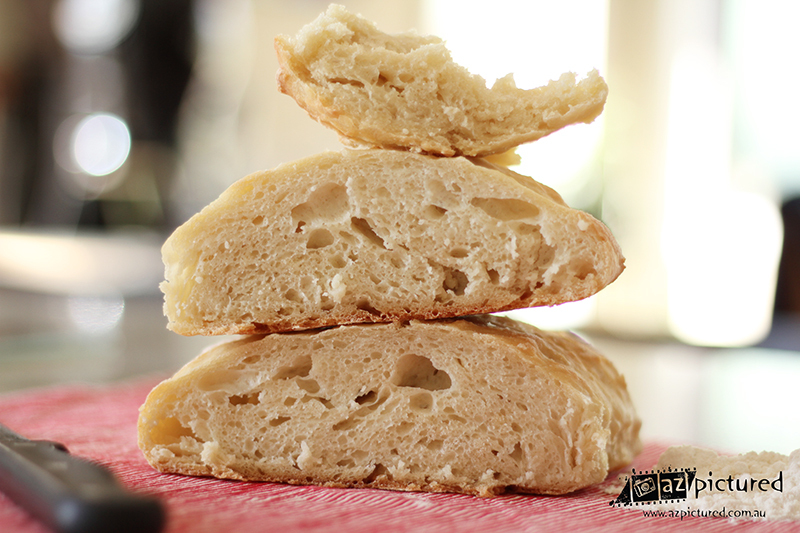 But bread making takes time and one cannot rush the proofing, and the kneading is a labour of love. I cannot do it when pressed for time or feeling hectic …. therefore it hasn’t happened in a long time. This No Prove Bread was too easy, and absolutely wonderful. 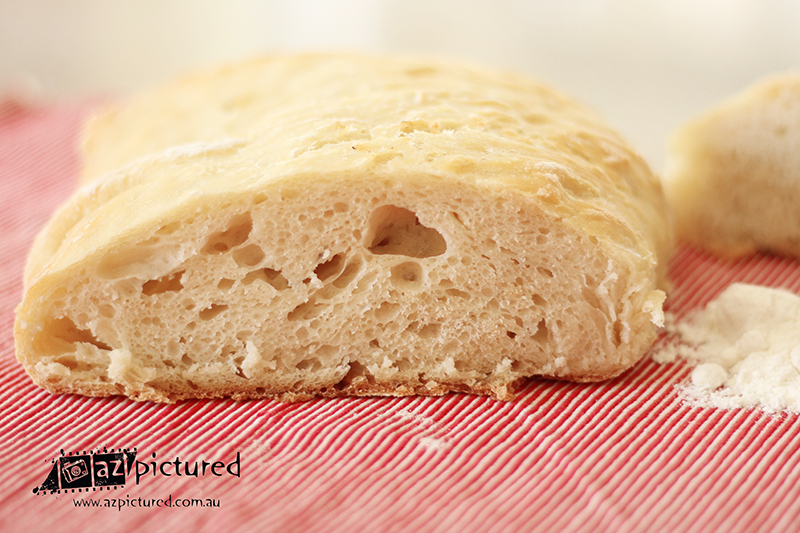 Not really a dense type of bread, more a Ciabatta, but oh so yum. And we made our own butter. I don’t have one of those fancy kitchen machines, I still have a handheld mixer which has done me great service and I would never want to exchange it for anything else. Let’s just say it has personality. Gotta love it when recipes are vague. Looking easy peasy in the video, the words only read ‘Mix until mixture splits’, and I think we almost got to the end of my poor handheld mixer. After looking at lovely thick, creamy, swirly waves of thickened cream and sourcream mixture for what seemed like ages, within half a second the whole gorgeousness turned into watery slush with bits in it, which was of course the butter. We made garlic & herb butter out of it, that was to accompany our freshly made bread and the barbecued steaks that were sitting in their marinade. It would have to be a strange person who can resist the smell of freshly baked bread, so we tested it with Nutella. Yum. As it was evening and neither the right time nor the right light for an elaborate photo shoot, I had great plans of doing that the next day. Half a loaf of bread was meant to be left for that. So all I can present you with are some measely shots from my phone. 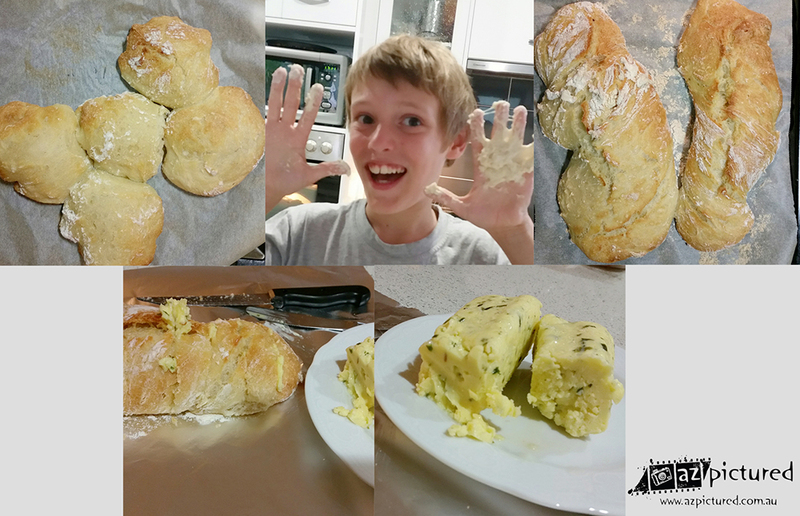 I was requested to make the bread again for a Sunday morning, so I have two more photos, minus the yummy butter.